Today is my Mom’s Birthday! Happy Birthday Mom! Today is my Mom’s Birthday! Happy Birthday Mom! This is a big day for you, and I hope that you have a wonderful day and weekend! 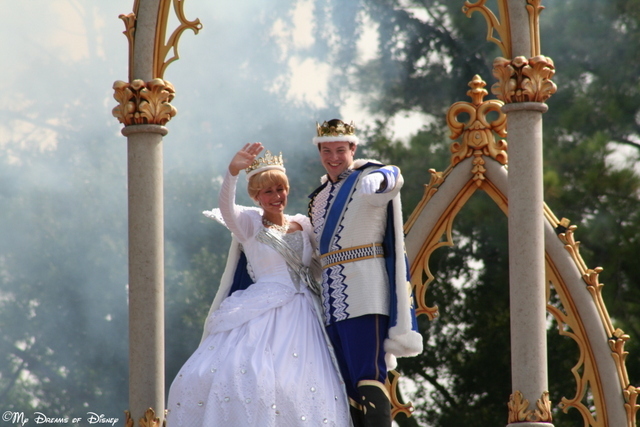 The pictures that I’m including in this post were taken when we took Mom to the Magic Kingdom for a day back on August 2nd, 2006. This was Sophie’s second trip to Disney, and as you can see, my daughter already knew that she was a Princess! 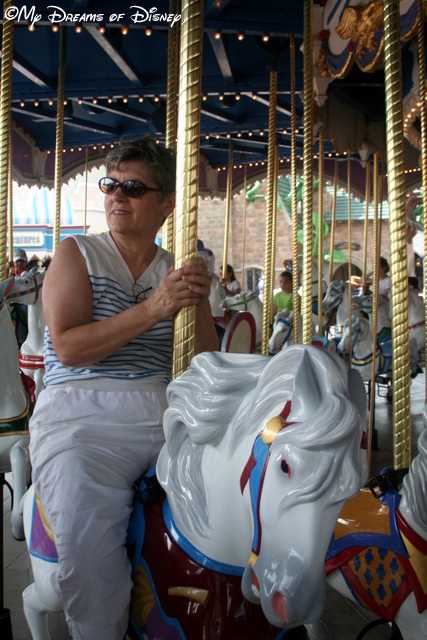 My Mom enjoying herself on the Carousel! My Mom is not one for thrill rides, so riding something like the Carousel, and it’s a small world, and seeing the Country Bear Jamoree — those are right up her alley! To her credit, she did try the Barnstormer kiddie roller coaster with Sophie (although she didn’t enjoy it at all). Over the years, my Mom has been through a lot, and it is a testimony to her soul, and her kind spirit, and her upbringing that she is the person she is. All of you that are regular readers know that I am a man of Faith. My Mom is living proof of the evidence of God’s existence. My Mom was bitten by a mosquito when she was about 1 year old, and contracted a very serious illness. My Grandpa had to teach her how to talk and how to walk again, and she came very close to not being here. My Grandpa was assigned to the Washington, DC area in the early 60s to manager the United Airlines hangar setup at what was to become Dulles International Airport, so of course my Grandma and their children moved to the area also. It was while they lived in the area that my Mom and Dad met — on a blind date — were married on May 1, 1964 — over 50 years ago. Sometimes I think it is easy for us to think that God has nothing special in plan for our lives. I wonder if my Mom ever wondered that about her life? What I know is that the events of her life, from early on until this very day, are proof of the special role that God has for her, and for all of us. Mom, I love you with all of my heart, and I am proud to be your son. Sophie and her Meemaw sitting on Minnie’s Love Seat! August 1, 2006. On that day, Cindy, Sophie and I took Meemaw to Walt Disney World to visit the Magic Kingdom for the day. For my Mom (aka Meemaw) it was her first trip to Disney World since she went with me on my very first Disney trip, 27 years before. Currently, this particular trip is also the last time that Mom has been to Walt Disney World. Since we were just there for the one day, we didn’t really spend a whole lot of time planning this day out — we just took it and went with it, and I’ve got to say, that one-day trip was one of the best days I can remember. We were relaxed, we rode the rides and saw the things that Sophie and Meemaw wanted to see — we even convinced Meemaw to ride Goofy’s Barnstormer (which she didn’t like, and wouldn’t ride again!) Let’s take a look at what were our favorite memories from that single day trip. I’ll start with my favorite memory. This picture of Sophie with that look of joy on her face is one of my favorites. That look, which never gets too old for me to see, is one of my favorite moments in that day trip. On the Monorail, here’s a shot of Sophie with her eyes covered. To surprise Sophie, we joked that we were taking her to New York City for the day, but imagine her surprise when we got to Walt Disney World! 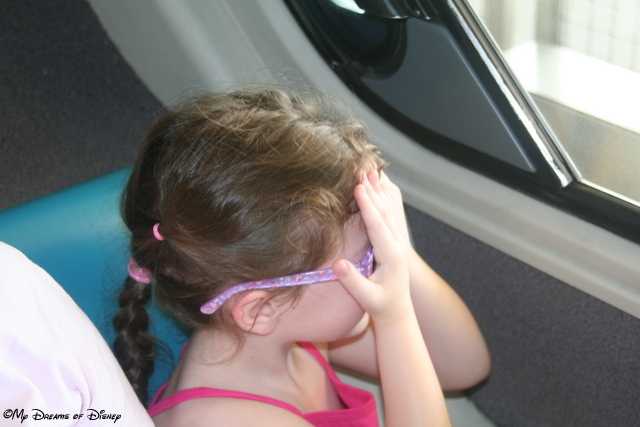 I think this picture is cute because she’s got her eyes covered before opening them to take in the Magic Kingdom all at once. I know as a kid I could never do that! 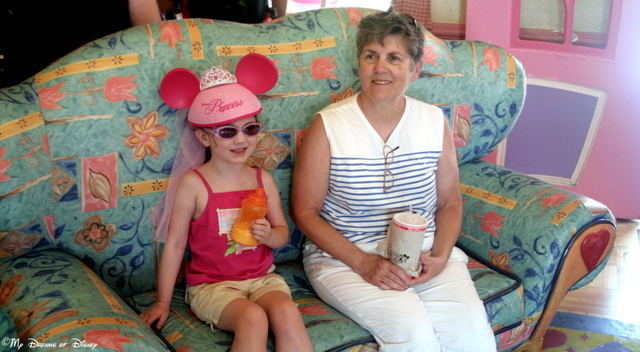 Another memory that Cindy liked was how Sophie talked Meemaw into riding Goofy’s Barnstormer. Meemaw didn’t like it, though, and wouldn’t ride it again! Still, she tried it, so that was what was important! Cinderella got married at her Castle! 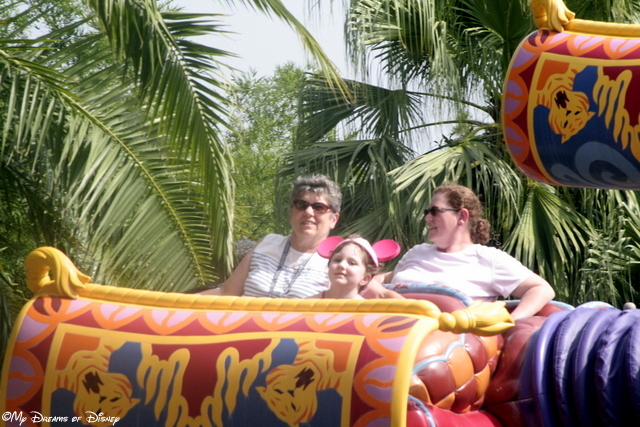 Meemaw, Sophie, and Cindy enjoying a ride on the Magic Carpets of Aladdin! Now that’s a ride that is more Meemaw’s speed…Speaking of Meemaw, I called her last night to find out what her favorite memory of that day was — and I have both her favorite memory and her least favorite memory! Stay tuned! Meemaw riding one of Prince Charming’s Regal Horses! The first real answer Mom gave me was that she just really enjoyed seeing Sophie’s excitement at being at Walt Disney World; at experiencing with Sophie the joy that she had with all the rides and fun that she had with everything. Hands down, that was my Mom’s favorite memory — seeing Disney through Sophie’s eyes. So there you have it, my friends, our favorite memories from our one day trip to the Magic Kingdom in 2006. This was a lot of fun, and next time, we’ll be looking at 2007, and our first ever visit where we stayed on property. So tell me, please, what are your favorite Disney memories? Please let me know in the comments, and thanks for stopping by! Remember, here at My Dreams of Disney, we’re working on turning My Dreams of Disney into Your Dreams of Disney! Tiggerific Tuesday Trivia – Goofy’s Mailbox! Today’s Trivia is about Goofy’s Barnstormer, so this may trick you up! Hello everyone, and welcome to this week’s Tiggerific Tuesday Trivia! 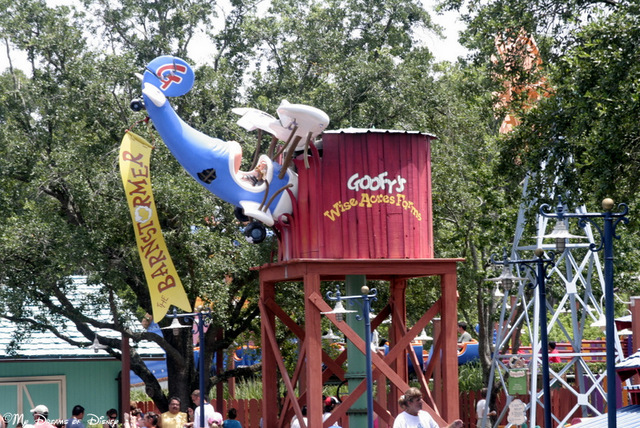 Today we are taking a look at an attraction that has been re-themed — Goofy’s Barnstormer! Now the Great Goofini, the ride is I think the same more or less, but if I’m wrong, please correct me. As a roller coaster fan, I’ll admit that I grew up a self-proclaimed roller coaster CHICKEN! In fact, it wasn’t until I went to a theme park in Virginia that I became a fan. But that’s another story for another time. Over the years, I have become a huge fan of the roller coaster genre, and Walt Disney World, in my opinion, has some of the best roller coasters on the planet. A lot of my friends will disagree with me, saying that this roller coaster, or that roller coaster is better, but to me, there is a whole lot more than how many loops a roller coaster can do, or how far the drop is. To me, what sets the roller coasters at Walt Disney World apart from all of the others is the theming that the Disney Imagineers put into planning the attraction. I believe that Disney spends more time on the theme of an attraction than any other “theme” park in the world, and it is the theme of their lands, attractions, shows, and other things that really sets the parks apart from all of the others. Now, after all of that build-up, I am going to give you my rankings for my favorite roller coaster rides at Walt Disney World. I know what you are thinking. I am absolutely insane by including The Barnstormer in my listing of my favorite coasters. I have now lost the two readers that come to Chip & Company to read my material. I can’t be serious. However, my friends, I am serious. The Barnstormer was the very first roller coaster that my daughter Sophie ever rode, and the moment she got on that coaster, she was addicted. There is not a single roller coaster that my daughter will NOT ride. My wife and I enjoyed it too! It was a quick ride, certainly, but when we went that first year, the park wasn’t very busy, and Sophie wanted to ride it again, and again, and again, and again, so we ended up riding that thing probably eight times in a row. You know why we did? Because there was no line. We walked off, turned around, and walked right back on. It was fun. It was quick. It provided excitement for us. It was great. 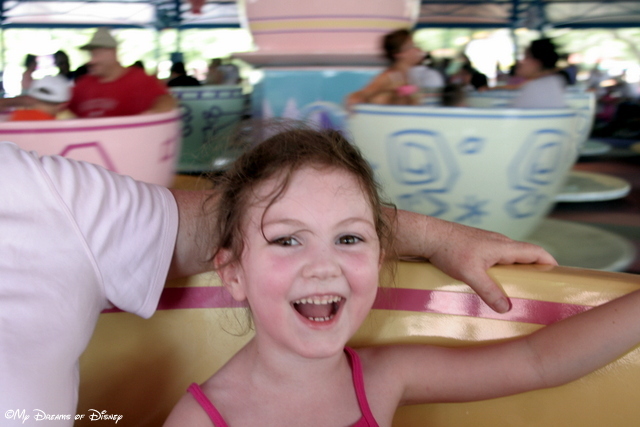 Today, we don’t ride The Barnstormer as much, simply because Sophie has moved on to many other fun and challenging rides, but I have a soft spot in my heart for those days when Sophie was excited beyond compare by the simple joys of that roller coaster. With the closing of Mickey’s Toontown Fair, I’m not certain what the future holds for The Barnstormer. I hope it stays to be enjoyed for generations to come. When we first wanted to ride Primeval Whirl, it continually amazed us that you had to be 48” tall in order to ride this roller coaster. For the first two years, Sophie wasn’t tall enough to ride it, but in year three, she was. The Whirl is not your typical roller coaster, in fact, I’m not sure if it should be classified as a roller coaster at all. But for our discussion, that’s what I’m calling it. The Whirl is a fun ride because it takes you fast through some turns, dips, climbs, all sorts of things that spin you around and almost make it seem like you are going to fall right off the edge of the structure. In fact, in some ways Primeval Whirl may have more thrills than some of the other coasters because it is a completely different experience. The circular car really makes a difference, especially when it is turning you around this way and that as you make one of the 90 degree turns on the track. The Primeval Whirl is located in Animal Kingdom at DinoLand U.S.A.
Space Mountain is a ride that I enjoy, but I haven’t ridden it for a few years. The first time I rode it I kept trying to anticipate which way the coaster was going to turn, and since night vision isn’t my thing, I was anticipating completely wrong! By the end of the ride I had a headache from the jarring. However, I did ride Space Mountain again after that, and when I decided that the key was to just go with the flow, I really enjoyed the ride. Sophie isn’t a big fan of it because it is in the dark, but she has told us that she is going to try it again when we go in June. However, while the appeal to Space Mountain is that it is in the dark, I feel like it takes away something from the ride. We haven’t ridden it since it was renovated, so I’m looking forward to reacquainting myself with the ride. Space Mountain is the signature attraction in Tomorrowland, located in the Magic Kingdom. Expedition Everest is one of those rides that I, for whatever reason, never seemed to ride – until this past June. Then we all rode it, and I liked it! For me the most gut-wrenching part (I say that literally) was when we rode backwards down the track. I did feel like the speed of the coaster was a little slower than I would have liked. But I liked the coaster, and will ride it again. Last time I was in the very back of the train, so this year I’ll see what it’s like at a different location! For me, I really like the mountain. Additionally, the Disney Imagineers have done a great job in theming this attraction. In so many ways, the theming of an attraction also helps to make the wait in line seem shorter because you can look around and see all the little details of the ride. Expedition Everest is located in Animal Kingdom, not far from the Kali River Rapids. I absolutely LOVE Big Thunder Mountain Railroad. It is one of my favorite roller coasters anywhere, not just at Disney World. There is so much to experience with BTMR that it is easy to ride it over and over again just to pick out the things you missed before. Have you ever ridden it at night? If you haven’t you absolutely must experience that at least once. It introduces a totally different dynamic into the ride. Have you seen the dancers dancing above the saloon? If you haven’t, look for it. BTMR is one of those attractions that delivers – over and over again! Big Thunder Mountain Railroad is located in Frontierland in the Magic Kingdom. I wonder where I have been all my life – six years in a row we have gone to Disney for at least one day, and in the previous five years, I never rode the Rock ‘n’ Roller Coaster. How stupid have I been?! Last June I made the distinct decision that I was going to ride this roller coaster, and when we were at Disney’s Hollywood Studios we did just that. We had a Fastpass for it, so we walked right on. In fact, we walked in the queue so quickly that I didn’t even pay attention to the limo leaving with the previous group of riders. You know what? That was better, because I had NO IDEA how quickly that limo was going to take off! The initial start is from 0-60 in 2.8 seconds, immediately propelled into the dark with the music of Aerosmith blasting in your ears! The ride contains a corkscrew, a loop-de-loop, and several high speed turns, all with the music playing. The ride is in the dark, but there are several neon signs to look at, so it really is cool! The Rock ‘n’ Roller Coaster immediately became my favorite roller coaster anywhere, not just at Disney World! But tell me, what are your favorite roller coasters at Walt Disney World? How do they compare in your eyes with roller coasters at other theme parks? Tell me in the comments below, and thanks! 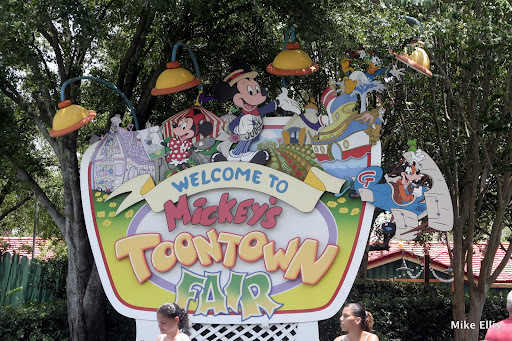 Mickey’s Toontown Fair is the newest of the Magic Kingdom lands, and unfortunately, it is also the first of the lands to be closed. Toontown Fair is the unfortunate casualty of the expansion of Fantasyland, and as a result, much of the land is going to be disappearing, if it hasn’t been closed already. Because of this, if you are able to go, and haven’t been yet, now might be the best time to get down to see Mickey’s Toontown Fair. The Fair was opened in, I believe, 1988 to celebrate Mickey Mouse’s 60th birthday. Originally, the fair was called “Mickey’s Birthdayland”, and was slated to be a short running expansion. However, the guests loved it, and flocked to it in such numbers that it was decided to continue the fun, but with a few tweaks made along the way. Since the Toontown Fair is the smallest of the lands, there isn’t as much to do here, however, the land has it’s own unique traits that give the “Fairgoer” a good time, and a lot to see. The real beauty of Mickey’s Toontown Fair is in the details, and the story behind the land. As I understand it, you won’t always find Mickey in the Toontown Fair, even though it would be a reasonable expectation to think that he would be there. However, the thing that you need to keep in mind is that Mickey and Minnie’s full time homes are actually in Disneyland, not Disney World. The homes that are in Mickey’s Toontown Fair are actually Mickey and Minnie’s vacation homes, so for this reason, when they aren’t on vacation, you won’t see them in their homes. You can press the play button on the answering machine to hear the messages left for Minnie — and there are a lot of messages! You can bake the cake in the oven. You can open the refrigerator to see all the selections of cheese that Minnie has. You can pop popcorn in the microwave. The details in the houses — both Minnie’s and Mickey’s — are incredible. Mickey’s doesn’t have many things to do, it is more of a walk through museum type view, but despite that, there are a lot of things to see. Take a moment to check out the kitchen that Goofy and Donald are working on, and take a look at all of the tools that there are in the garage! Goofy’s Barnstormer roller coaster, which is how we as a family think of Goofy’s roller coaster, was Sophie’s first roller coaster at Disney World. We rode it once, back in 2005, and Sophie was hooked! We got off of it, and rode it again — and again — and again. You get the picture. In all, we rode it at least four times in a row, and we have ridden nearly every year since. Now, though, our daring nine year old has progressed to Big Thunder Mountain, the Rock and Roller Coaster with Aerosmith, and other hi-intensity rides. As a land, Mickey’s Toontown Fair is definitely the smallest, and some people think that it isn’t any big deal that it is being absorbed into the Fantasyland expansion. However, to me, some of the biggest things that the Fair has going for it are the little things. Being able to relax, to savor each part of the land, to just stroll like you would stroll through your own county fair at home. Those are the things that make Mickey’s Toontown Fair special, and it won’t soon be forgotten. I have no doubts that somewhere in the future we will see Mickey and Minnie’s homes. Where they will be I’m not sure, but something will be done with them I believe. Thank you for reading, enjoy the photos now and let me know what you think in the comments! Mickey’s disaster of a kitchen renovation! Goofy needs to take flying lessons! In the end, with Toontown Fair about to close, I’m going to miss it, and so are Cindy and Sophie. I really think it will be worth it in the end, but it still is a bittersweet thing to go through. That makes the pictures we have and memories we have all the more important, so thank you for reading.